Welcome to our Friday update! How did that happen so fast? Maybe it’s because we’ve been pretty busy! This week’s update title comes courtesy of Andrew, who, like the Kool-Aid Man, has been busy breaking through buildings! This week saw the return of building damage and stability, getting us further along on that path to large scale battles and sieges! This is simply the first pass of this work with much more coming! We’ve had plenty of other changes go in this week that have kept us, and those Backers who were able to join us, fairly busy. We plan to continue this testing tomorrow, for IT, Alpha, and Beta 1 Backers. This test will be an unstable build test. We’ll send out a separate testing email later with more info. Let’s move on to this week’s Top Tenish where we cover the week’s highlights. Testing: This week we ran multiple tests on Nuada Prep almost every day featuring code fresh off of Hatchery. 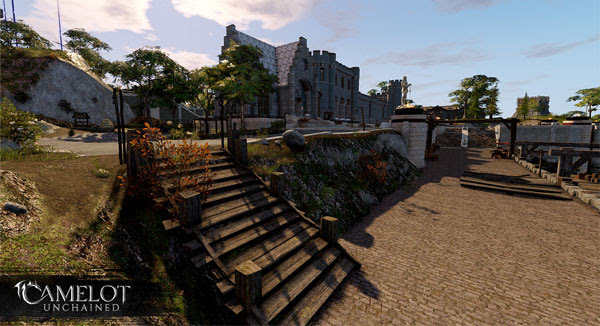 Biggest things of note in testing this week included testing building damage and stability and updates to tab targeting behavior and UI, along with asset updates to the realm home islands. 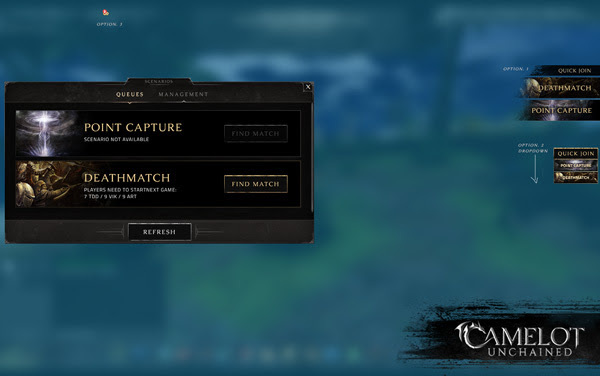 We also saw updates to the in-game compass HUD, now showing Warband player positions. Building Destruction: As some of you no doubt saw, we rolled out building damage testing this week, and are continuing to improve upon feedback and visualization. Building Stability: We also added building stability! When a buildings support structures are too damaged or cannot support the load, things frankly start to fall apart! Tech – Lights: George and Dave have been working on improving our lights. Lights now show more realistic highlights and falloff and have more options for tuning by the artists. That tuning will occur in a later build. Tech – WIP – Targeting: This week gameplay worked on updating targeting visualization and tab targeting. This still requires some iteration, but you should see it in game soon. Tech – Offline Zone control: Matt landed some work for offline modes, which allows you to change zones in offline mode without restarting the client. This is mostly useful in offline building mode. It’s currently hooked up to `/zoneselect`. Tech – UI – Inventory Bug fixes: Some annoying bugs were fixed in the Inventory UI; You can now swap equipped items, see the name of crafted items in the tool tip, and no longer see items fail to update when harvesting. WIP Design – Mages: Ben has begun working on our next classes, mages! We’ve still got a bunch of work to do to get them into the game but the process has begun. Art – WIP – Scenario UI: James is working on updates for the scenario UI that will add a lot of readability when it lands. Art – WIP – Death Animations and FX: Work continues on the updated special death animations and effects for the current classes. Art – WIP – Battle Music: dB added some more transitions in the battle music which should see some updates in the coming builds. 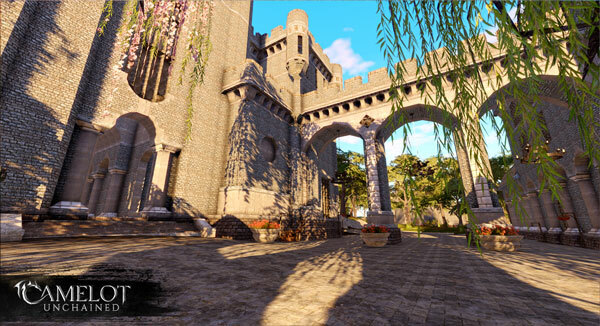 Art – Environments: Tyler and Dionne performed some janitorial services to the home islands, cleaning up work from earlier in the week as well as adding in some more props and smaller details. Art – Characters: Jon is moving forward with our characters 2.0 work by investigating improvements to our characters proportions. He’s also working on some new pauldrons while Joe works to import in some new, previously made helmets. We saw how much players enjoyed making new gear, such as the capes, so we’re trying to get in some new items so players can further differentiate their characters. Art – Animation: Scott, Tyler, and Ben are moving forward with the next pass on ability animations to better support a wider range of ability timings. We’ve had a great week moving forward on several cool things, such as the building damage and stability, lighting, and art. We had several bug fixes and iterations that came in quickly from the team based on those tests so it was a particularly productive week in many areas. Let’s check out some art! We’ll start off with some work previously done by Jon. That fountain was intended to be non realm specific, so next thing I need to do is find a spot to put it! Dionne and Tyler (that’s me) have continued working on the home islands this week. The buildings on the islands were built by the Builder’s Brigade and placed by CSE. You guys did an awesome job! 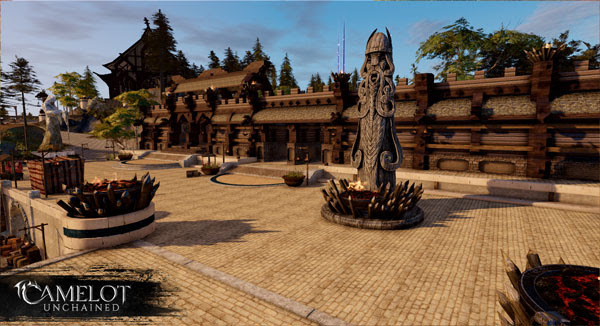 First up we have a shot of the Viking home island, Midgard, with a small village in front of a large hall. 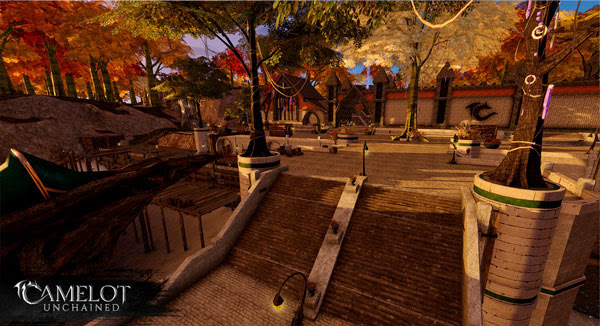 Here’s another shot, on the main dock, also on Midgard. Here we have a long shot of the docks, on Briton, the Arthurian home island. You can see the bank, wall and towers, built by our talented Builder’s Brigade. 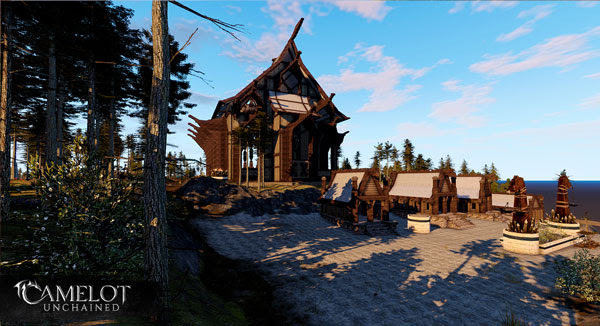 As we mentioned in today’s stream, we are ever thankful and impressed with these buildings. Here’s a shot on Briton. This image is from Eriu, the TDD’s home island. You can see how the Builder’s Brigade made realm specific buildings to celebrate each realm’s differences. That wraps up this week’s update. 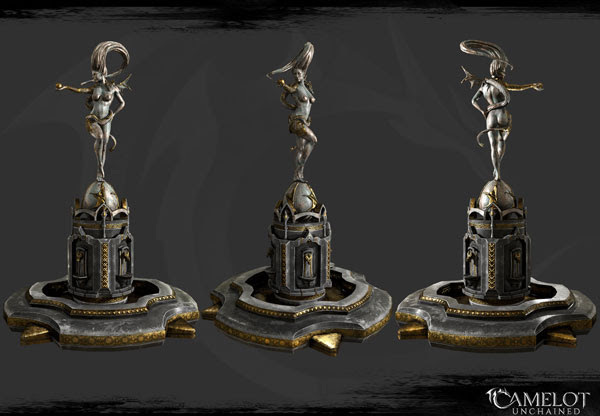 For those of you with Beta 1 access we look forward to seeing you in tomorrow’s unstable build test! (Testing email coming later this evening with more info.) Have a great weekend all!